Let’s face it — the iPad Pro 12.9-inch model is a big device. And since it’s a “tablet”, there’s a tendency to carry it around or take it with you more than other devices. And since it’s not always the easiest tablet to grasp onto — again, largely because of it’s size — it’s a whole lot easier to drop than most devices. That’s why you want to make sure that there’s a case on it — something that can absorb the shock of an accidental drop so you don’t ruin your thousand dollar or more investment. A case shouldn’t just be protective though, they should be efficient as well, such as being able to easily carry extra accessories, such as the Apple Pencil. With that in mind, if you follow along with us below, we’ll show you the seven best iPad Pro 12.9 Case with pencil holder. Here are our top picks. Up first, we’re looking at ZUGU’s very own The Must Case. 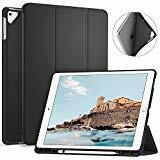 This protective case will keep your 12.9-inch iPad Pro (2018) well protected, and even has a slot for you to set your Apple Pencil. Not only is it a nice holder, but it keeps wireless charging on the iPad Pro working, so that your Apple Pencil is always ready to be used. It has an adjustable magnetic stand, giving you 10 different positions that you can setup your iPad Pro in. A rugged TPU bumper and polycarbonate shell ensures that your iPad Pro has 360-degree 5-foot drop protection. Naturally, there’s auto sleep and wake functions via magnets in this case holder as well. It comes with a one-year replacement warranty, keeping you protected against any defects from the manufacturer. The next case on our list that we’re looking up is the MaxAce Pro 12.9 Folio Cover Case. This case is made out of a silicone — it does a really great job keeping your new iPad Pro safe from drops and general accidents. However, it also has a folio cover — that means that the case keeps your screen protected as well. It stays free from nicks and scratches. This case also has a magnetic enclosure, which automatically wakes or sleeps your iPad Pro based on opening or closing the case. When you open it — if you want — the folio cover can actually be opened up and folded into a kickstand for easier and more comfortable viewing. On the top side of the case, there’s a secure holder to keep your Apple Pencil in place. Coming up as our second contender, we have the Ztotop iPad Pro 12.9-inch Case. 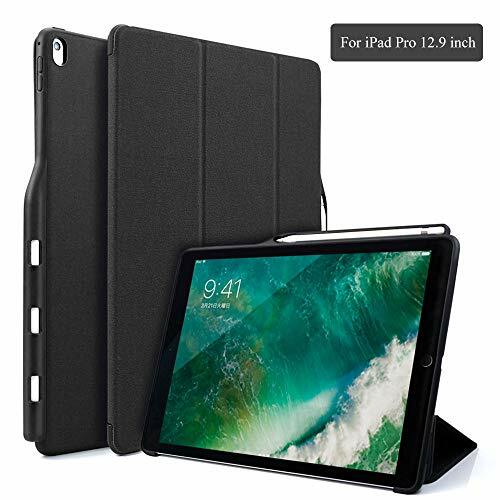 This case has a soft TPU backing, keeping your iPad Pro 12.9 safe from any surface scratches. The case can also help you absorb shock in the event of an accidental drop or fall. It has a folio cover that keeps your screen protected, and it has that magnetic enclosure to auto wake or sleep the device as well. There is, of course, the secure spot to keep your Apple Pencil in place as well. Maybe you’d rather not get a full case for your iPad Pro, and instead are looking for a way to lug your Apple Pencil around without losing it. Enter, Fintie’s own Pencil Holder. The Pencil Holder comes in a wide variety of different colors, designs, and patterns, but can easily attach to any pouch, briefcase, purse, and even a belt loop. The material is made out of premium synthetic leather, giving this holder a luxury-like feel as well. The Apple Pencil fits like a glove here, and is easily inserted and removed, as you wish. If you’re looking for something a little more stylish that has that “business professional” look to it, then you’ll definitely want to check out this case by ProCase. On the outside, it looks like your standard black enclosure, but on the inside, it actually has some nice, almost leather-like tones. The folio cover keeps your screen free from scratches and nicks, and the magnetic enclosure makes sure to auto sleep or wake the device. You can actually fold it out to use as a kickstand for a more comfortable viewing angle. Lastly, you of course, have the material there to keep the Apple Pencil securely in place. 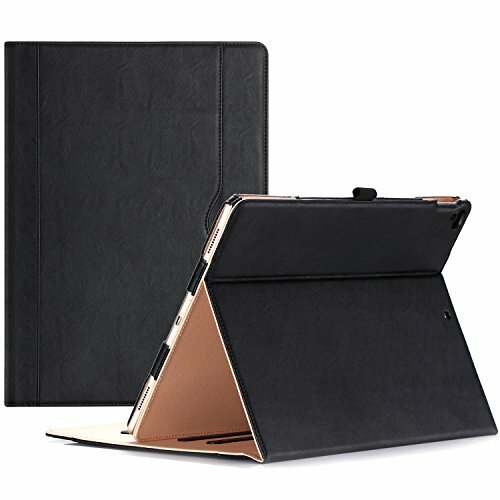 Coming up as fourth on our list, we have the Ztotop Premium Leather Slim Folding Case. In function, this one is similar to all of the others on this list; however, a different material is used, and that is a faux leather. It actually comes in a bunch of different colors. 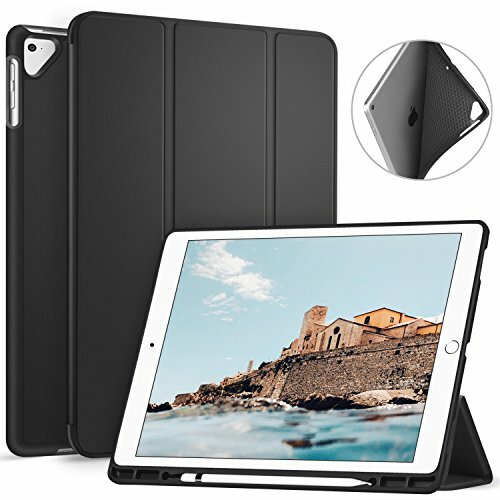 It’ll keep your iPad Pro 12.9 well protected, absorbing the shock of most falls and drops. 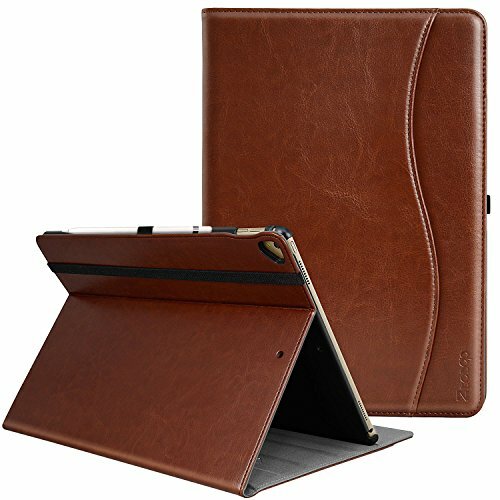 It has a folio cover to keep the iPad’s screen protected from scratches and nicks as well. That folio cover can be folded out in a stand at a couple of different angles to offer more comfortable viewing. The KHOMO iPad Pro 12.9 With Pen Holder might come up as last on our list, but it’s still a really neat case for the device. Like the other cases on this list, it does have that folio cover to keep your display well protected. It also has an insert on the side where you can securely set your Apple Pencil or another pen or stylus. It has magnets inside the screen cover, which is really good for auto waking and sleeping your iPad Pro. As you can see, there are a lot of excellent cases for the iPad Pro 12.9. 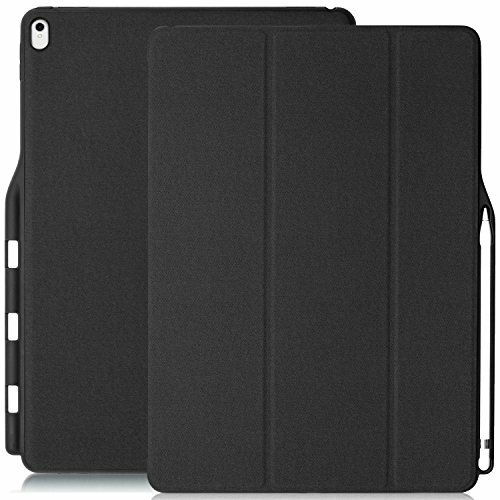 Any one of these cases is certain to keep your new tablet well protected, while providing you with a secure place to keep your Apple Pencil. Which one is your favorite case? Let us know in the comments section below.